In late February, President Putin, in his message to the Federal Assembly as one of the retaliatory measures of Russia for the US withdrawal from the Treaty on Intermediate-Range and Shorter-Range Missiles (INF) and the deployment of American missiles in Europe, called the fleet reinforcement. He ordered to accelerate the construction of submarines and ships. This directly concerns Sevmash, where Minister Shoigu arrived on Tuesday with a check. 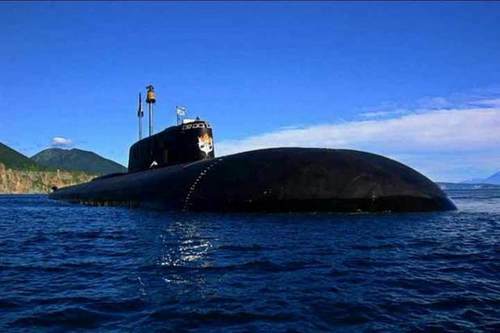 The main issue is the completion of tests and the delivery in 2019 of the strategic submarine of the Borey-A project (995A) Prince Vladimir and the nuclear submarine cruiser of the Yasen-M project (885M) Kazan, as well as repair and modernization Project 11442 heavy nuclear missile cruiser. “Prince Vladimir” is a fourth-generation strategic nuclear submarine. This is the fourth ship of Project 955 “Borey” and the first built according to the modernized project 955А (09552) “Borey-A”. Vladimir Putin attended his bookmark, which took place on July 30, 2012. Perhaps that is why now in the West there are legends about the “deadly” power of the new submarine, which, with a fright, the British media even called Putin the Monster. According to the plans of the Ministry of Defense, the newest Boreas should become the basis of the Russian nuclear nuclear triad, replacing the third generation nuclear icebreakers of the Kalmar 667BDRM and the Dolphin 667BDRM project. Today, three Project 955 cruisers are already on duty in the world’s oceans: in the Northern Fleet — Yuri Dolgoruky; in the Pacific — Alexander Nevsky and Vladimir Monomakh. All Borey-class cruisers are low-noise – modern sound-absorbing materials are used in their designs, propellers are placed in special ring nozzles, and in case of emergency, instead of propeller-type screws, they can use jet propulsion systems for movement. Boreas are equipped with modern radio-electronic and sonar complexes. “Boreas” – carriers of intercontinental ballistic missiles R-30 “Bulava”. The submarine can carry up to 16 nuclear missiles in mines. Each is equipped with six 150-kiloton individual-guided combat units and is able to easily overcome enemy missile defense systems. The advantage of the P-30 is the so-called dry start. This is when, before launch, the mine where the rocket flies from is not filled with water. This reduces the likelihood of detection of the submarine by the enemy. In addition, the P-30 can even start from under the thickness of the Arctic ice, which is impossible for other types of missiles. At Sevmash, the Minister was shown the Kazan submarine. This is the first nuclear submarine, built on an improved project “Yasen-M”. Until 2027, the construction of seven submarines of the project “Yasen-M” is planned. Now there are five at different stages of construction: “Novosibirsk”, “Krasnoyarsk”, “Arkhangelsk”, “Perm”, and “Ulyanovsk”. The innovations introduced into this project concern the element base of radio engineering armament, modernized equipment and materials, as well as fundamentally new architectural features of the hull. The basis of the arsenal of submarines of the project “Yasen-M” – cruise missiles “Caliber” and supersonic “Onyx”. And, as suggested by a number of experts, after the end of the test cycle, the submarines will also be equipped with hypersonic Zircon missiles. About them recently told Putin. Able to reach a speed of 9-10 Mach and hit targets at a distance of over a thousand kilometers. In the future, submarines of this project will become the main multi-purpose nuclear submarines of Russia. The fleet and the heavy nuclear missile cruiser “Admiral Nakhimov” of project 11442 are waiting. Its repair and deep modernization should be completed at Sevmash by 2020. After that, experts say, this “aircraft carrier killer” will become the most powerful ship of the Russian Navy. The modernization plan provided for the replacement of life support systems, radio equipment, ship power engineering, as well as the installation of the latest computers. They will significantly increase the speed of decision making under combat conditions, and in some situations they will be able to determine the type of target themselves and automatically issue a command to destroy it. Artillery and rocket weapons will be replaced. There will be hypersonic anti-ship missiles “Zircon”, as well as “Caliber”, received fame after strikes on terrorists in Syria. Given that the task of hastening the construction of sea-borne missile carriers was set by the Supreme Commander himself, control over its execution will be tough. And Shoigu’s working trip to the largest military shipyard is proof of that.